I can remember 1978. 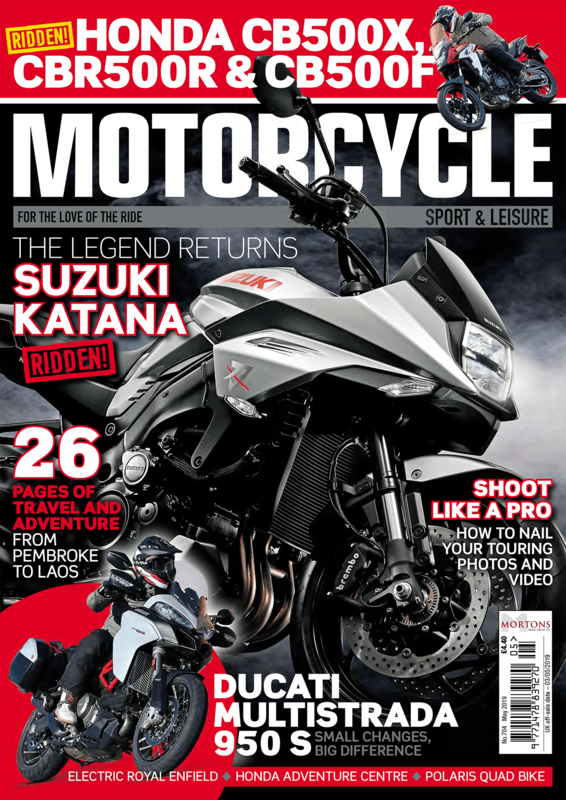 I read a magazine article on the Bol d’Or by one Zed Zawada. It was so inspiring I rode from Peterborough down to the Bol d’Or the following year, in one hit, though that bit wasn’t planned. We’d got chatting with some German riders during a fuel stop, early evening just north of Paris – when we explained our plan to camp for the night it quickly became clear this was simply not done. Blast for the sun, don’t stop until you hit the Med and sleep on the beach. I did it, and since then I’ve had the fever bad, real bad. There have been many trips to the Bol since, including one by van to pick up a journalist’s stolen test bike in Marseilles. It was an early Yamaha R1, and rather than load it straight into the van, I couldn’t resist giving it a quick blast up the infamous twisty DN58 to Paul Ricard. Still, that’s a story for another day. Small tankbag and waterproof roll-top bag made up the R1’s luggage. Years later, I’ve got my own R1, and the plan to ride it down to the Bol along with my brother Chris (Honda SP-1) and pal Chris 2 (Kawasaki ZXR600). As if that weren’t confusing enough, we were meeting three Marks down there, two of whom rode down while the third (short of time) took an easyJet to Marseilles. Mark 3’s trip worked out significantly cheaper than riding down, but I couldn’t help feeling that he’d missed out on the experience somehow. All of us were there for the full Bol d’Or experience, finally back at Paul Ricard after being held at various French circuits over the years. 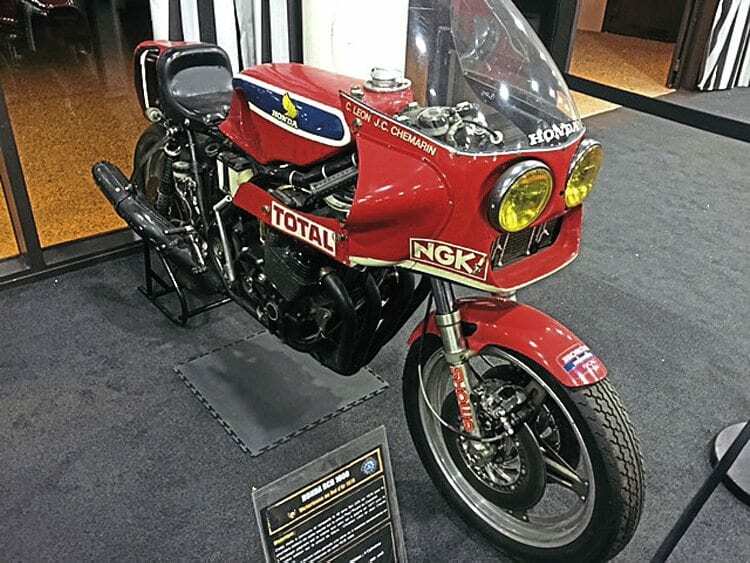 It’s still one of the best 24-hour endurance races, and before 1953, the rule was one rider per bike, so they had to do the whole 24 hours solo – Gustav Lefevre won that seven times on a Manx Norton! 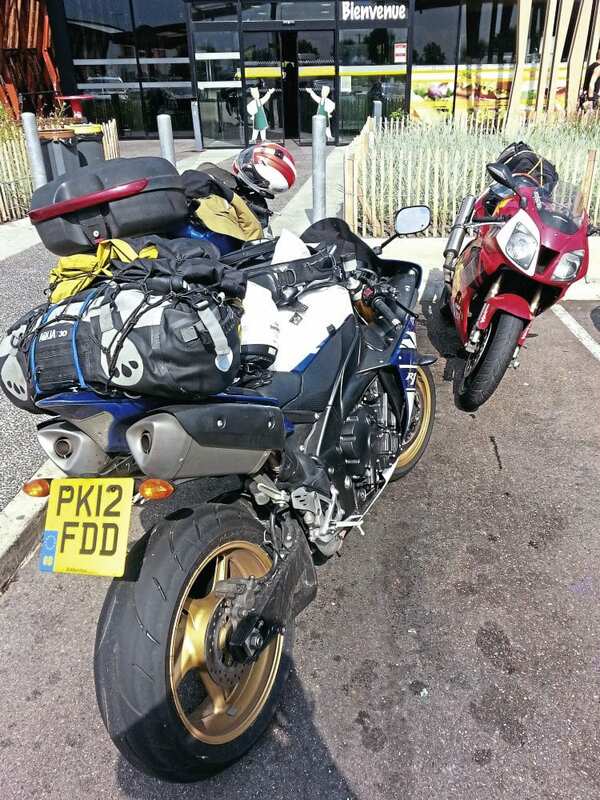 The days of Peterborough to Marseilles in one hit are long gone, though I did ride straight from home down to the Eurotunnel to meet the two Chrises, and I can tell you it was uncannily warm at 4.30am. With bikers collected together in the same carriage by train we were like naughty boys on a school trip. The banter started instantly and a couple from Milton Keynes told us of an excellent road they had been recommended linking Troyes with Dijon, avoiding the autoroute. Arrived! 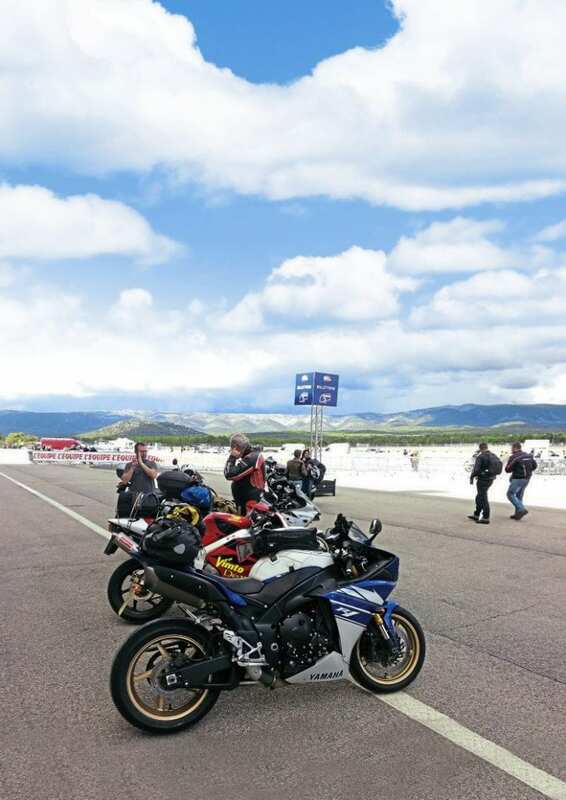 R1, SP-1 and ZX6R had no problem with the largely motorway route. The D971 was a welcome change from the wide autoroute, but perhaps not the promised land – one man’s meat etc. On the outskirts of Dijon we logged on to Booking.com and found the Hotel de la Colombiere in Chalon sur Saone, with its enclosed courtyard for parking the bikes. It was well placed, not five minutes from the town centre where we soon found a pizza bar for the evening. 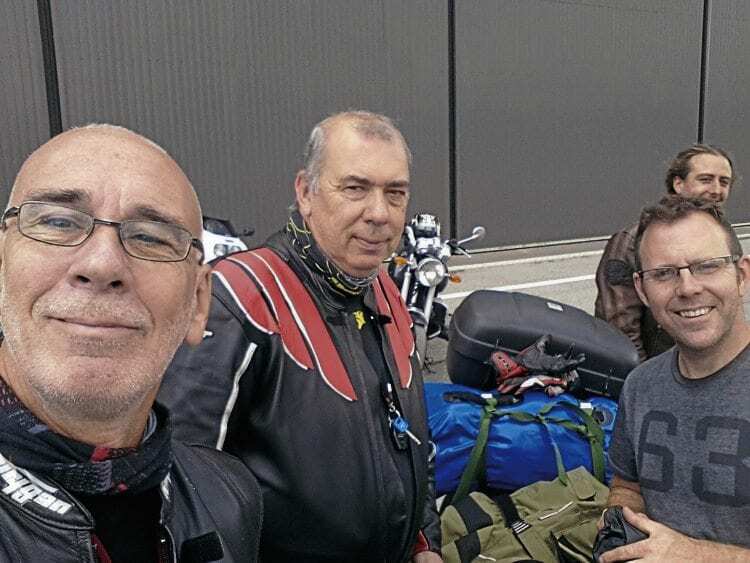 En route selfie – two days to ride through France was about right. Heading for Lyon next morning, looming up ahead was a Triumph Thunderbird, the lone rider sporting a GB plate. It could only be Mark, aka Mr Blobby, who had taken the previous night’s ferry to St Malo. 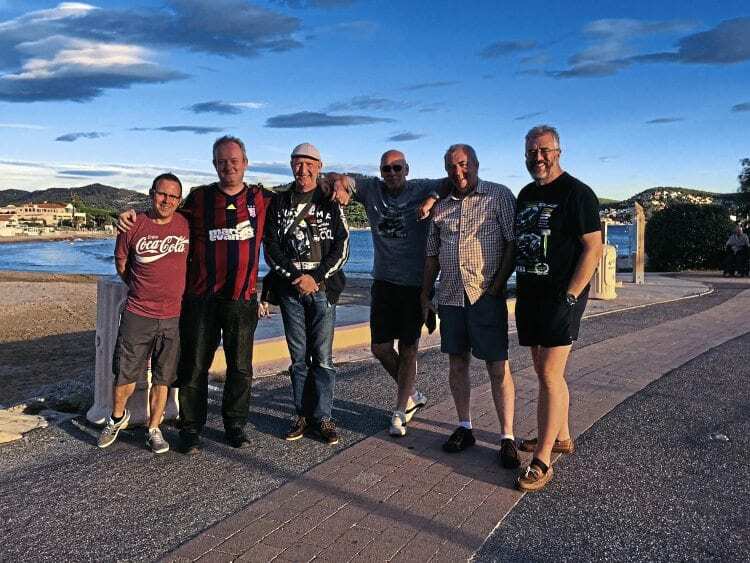 We pulled alongside, waved, hooted, gesticulated in a most gentlemanly fashion but clearly it was coffee time on the Triumph and all recognition failed. On the way down, autoroute stops offered all sorts of free services – now that really is a Welcome Break. Shortly afterwards we pulled into services on the A7 south of Lyon to refuel. And what a welcome! 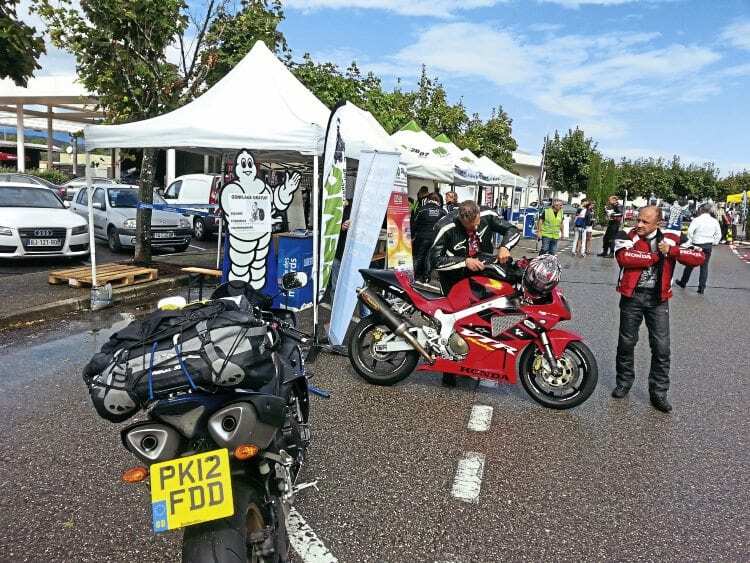 The French equivalent of BMF/MAG work with the region’s tourist body and local government to provide free coffee, tea, local breads and cakes, plus visor cleaning, chain lubing and tyre checks. There was even a rock band – can you imagine that at services on the M1 en route to Silverstone or Donington? As if that wasn’t enough, to prevent long queues at the autoroute tolls they had also arranged free travel for bikes south from Lyon! The Med looked exactly likes it’s supposed to. Arriving at the circuit mid-afternoon on Friday we took up the offer to buy a couple of ‘discounted’ tickets from a pair of guys whose women folk had bottled out – 50 euros each was a bargain for a full weekend’s racing. 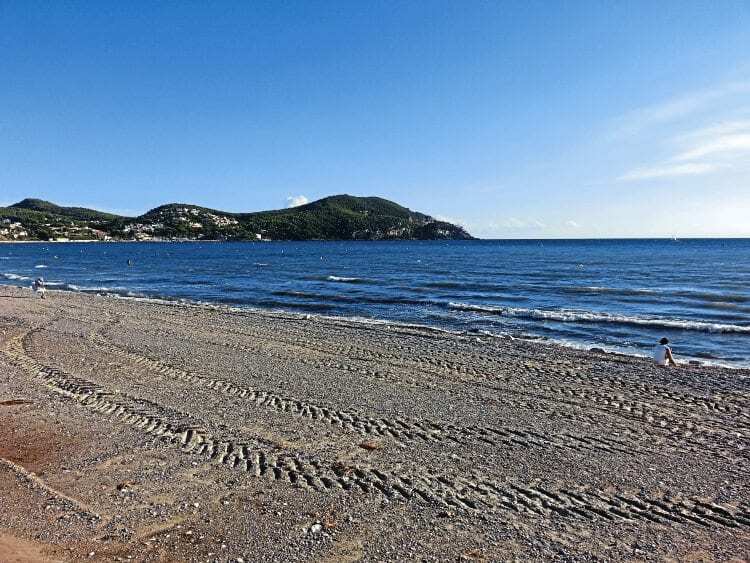 Then down to our hotel, a pre-booked Ibis in St Cyr that was close to the beach and a good ride away from the circuit, for a cool (if expensive at five euros each) couple of beers on the beach. The view across the bay made up for the price of the beer though, with a cruise ship on the horizon, lit up to complete a truly spectacular panorama. Grandstand view, and look in the foreground – they’ve even got sofas! The following morning, after a hearty continental breakfast, it was up to the circuit via the DN58 from Le Beausset. 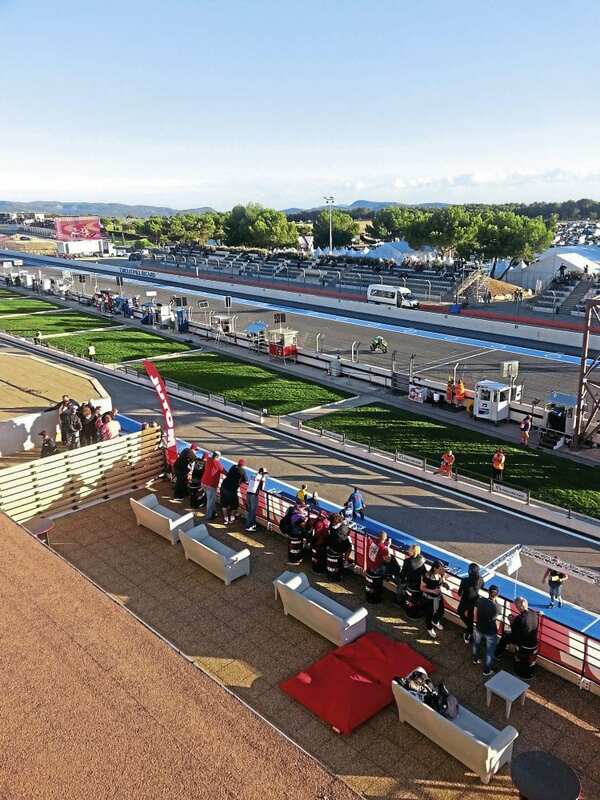 This is one of those roads that urges you on – short straights, long curving corners, tight testing bends, climbing to the plateau on which Paul Ricard sits, providing amazing views across the Med, and local photographers on the more challenging corners. This year the police kept a sensible view over everything, with a strong attendance but little if any involvement. Just have a good time and be safe seemed to be the message. 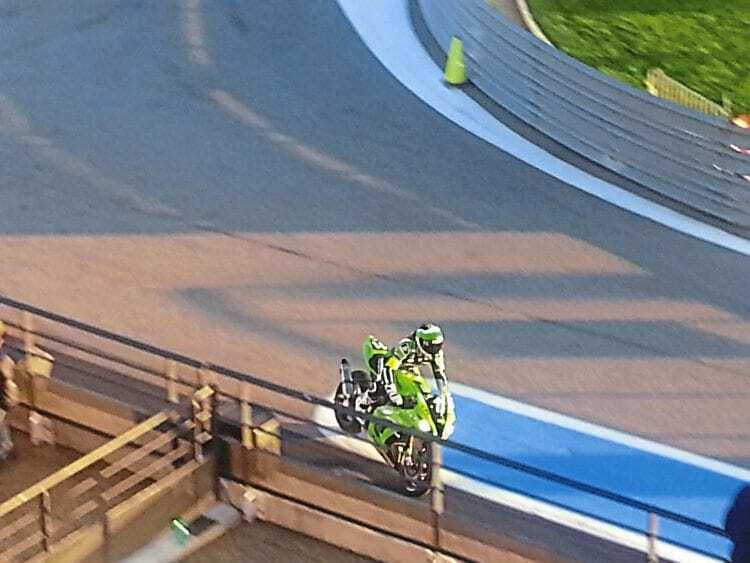 Oops, Kawasaki rider makes a last minute dive for the pits. I won’t dwell on the race, as by the time you read this it will be ancient history, but highlights included the start (with 55 teams lined up) delayed by 10 minutes when Louis Rossi crashed heavily on the Tecmas BMW S1000RR during the warm-up lap. It looked like a tad too much right wrist from where I sat, but I’m told the rear wheel locked up. Yamaha’s GMT94 was later to crash on oil and returned to the race in last position, 28 laps behind the leaders, but recovered strongly to finish a creditable ninth. Honda 111 withdrew shortly after midday on Sunday with less than three hours to go, blaming gearbox problems, while Suzuki SERT deservedly won, completing 687 laps followed by Kawasaki ZX10Rs in second and third places. FCC, Honda’s ‘development’ team, finished fifth on a CBR1000RR with 674 laps, showing how closely fought the 24 hours had been. An excellent weekend of racing, with no rain. 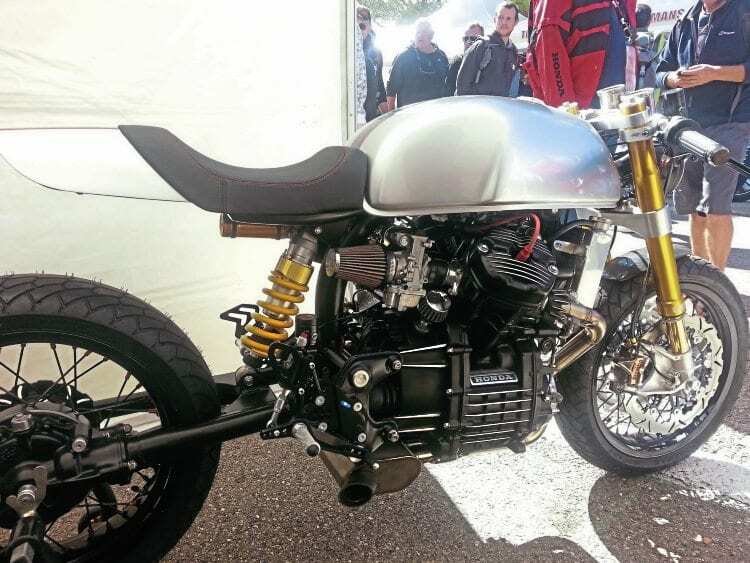 CX500 cafe racer in the trade stands. Sadly the days of free Ricard are gone. Yes it was freely distributed, “have you tried it with water, with coconut, with blackberry, lemonade, ice…” but there were some interesting trade stands showcasing French interests (spot the CX500 cafe racer) and classic bikes including previous Bol winners, all contributing towards a festival of motorcyding utopia. The following morning the three of us departed St Cyr heading north via Lyon, Dijon, Troyes and Reims toward Calais via those same toll autoroutes. The clouds darkened in a threatening manner around Lyon, but in contrast to the journey down it stayed uncannily dry throughout, even back in Blighty. Sadly the free autoroute deal had ended at midnight, unlike previous years when midday on Monday had been the norm. Not due back home in Peterborough until Tuesday evening, we stopped off in Reims for the night and a bloody good steak before stocking up on rillettes at Coquelles. Honda RCR1000 was a previous Bol d’Or winner. Back home, we’d covered 1891 miles in all, and I don’t usually like to count the cost, but for each of us it was just the wrong side of £100 for the tolls plus £230 for fuel and about £370 for hotels. One big factor was the cost of beer. Still, back next year? Bet on it. Do these men look like they’ve ridden through the night and slept on the beach? Thought not. Winning Suzuki flanked by podium Kawasakis. 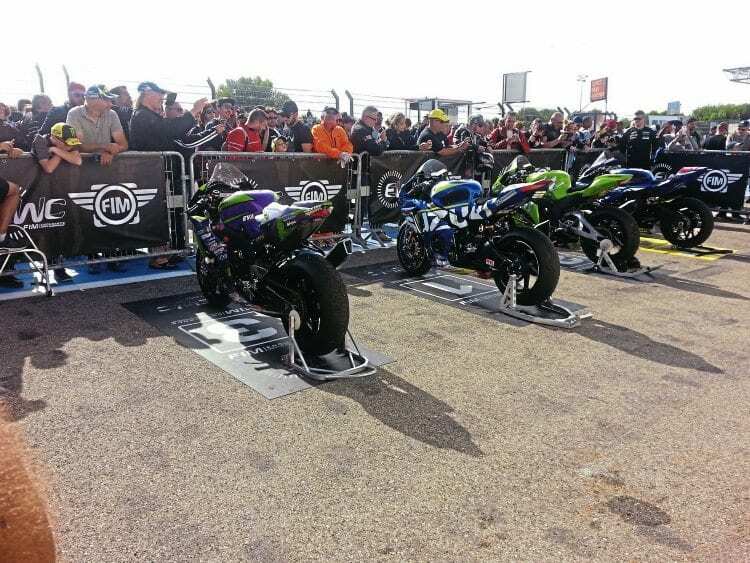 Endurance racing has long been a French speciality, and the Bol d’Or is no exception. In fact, out of 80 races so far, French riders have won no fewer than 62 times, if you count just the lead rider in each time. The Brits are runners up with just nine wins. But if French riders are naturals at winning endurance races, then French bikes aren’t – the last time one of those won the Bol was in 1939! Previous Post:MSL April 2018 out now!